Covert spatial attention alters the way things look. There is strong empirical evidence showing that objects situated at attended locations are described as appearing bigger, closer, if striped, stripier than qualitatively indiscernible counterparts whose locations are unattended. These results cannot be easily explained in terms of which properties of objects are perceived. Nor do they appear to be cases of visual illusions. Ned Block has argued that these results are best accounted for by invoking what he calls ‘mental paint’. 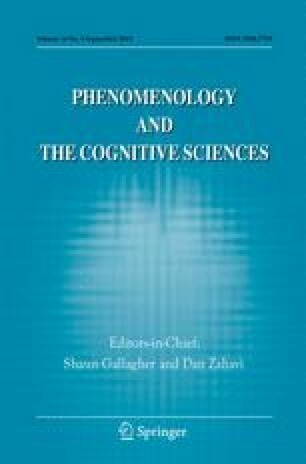 In this paper I argue, instead, in favour of an account of these phenomena in terms of the perceptual experience of affordances concerning saccadic eye movement. As part of the argument I draw connections with the empirical literature on the way in which performance efficiency also alters visual appearance. Anton-Erxleben, K., Henrich, C., & Treue, S. (2007). ‘Attention changes perceived size of moving visual patterns.’ Journal of Vision, 7 (11), Article 5. Available from http://www.journalofvision.org/7/11/5/. Montagna, B., & Carrasco, M. (2006). ‘Transient covert attention and the perceived rate of flicker’. Journal of Vision, 6(9), Article 8. Available from http://www.journalofvision.org/6/9/8/.